Shalimar II, a Pershing 90 is one of the best options to discover Ibiza and the Balearic Islands. With home berth in Marina Ibiza, this superyacht of 28 meters of length is defined by her aggressivity, elegance and speed. She has a maximum speed of 45 knots and an aerodynamic profile. She accommodates 8 guests in 4 cabins during the night and 12 for day charters. She offers a great dining area, a spacious flybridge, and sunbathing areas. 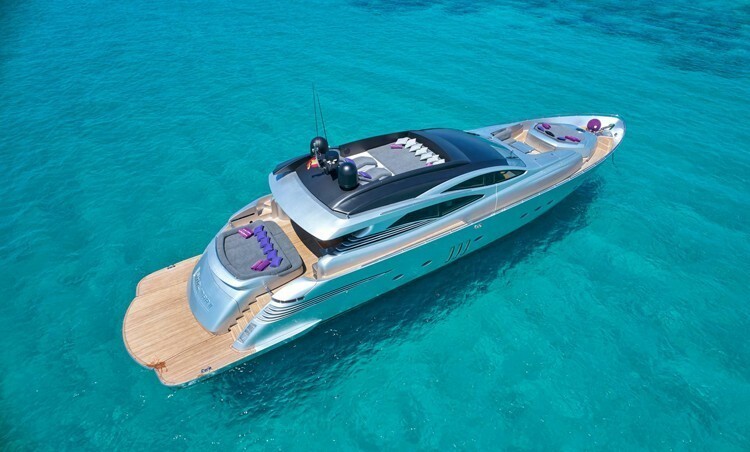 She is the perfect yacht for relaxing, sunbathing and to socialize with family and friends. On board, you will enjoy an exceptional service of captain, stewardess, deckhand and chef and will able to make use of her multiple watertoys.